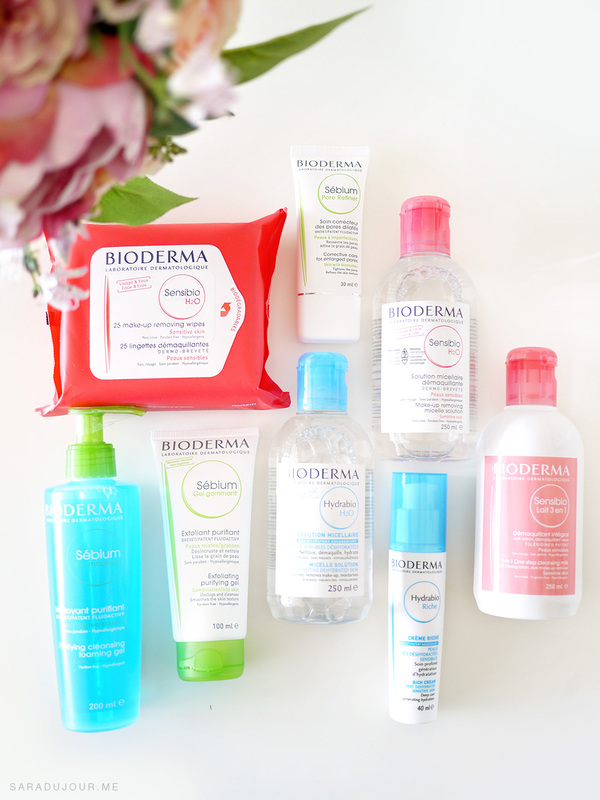 The kind folks at Bioderma Canada were lovely enough to send me a little care package full of goodies to try. 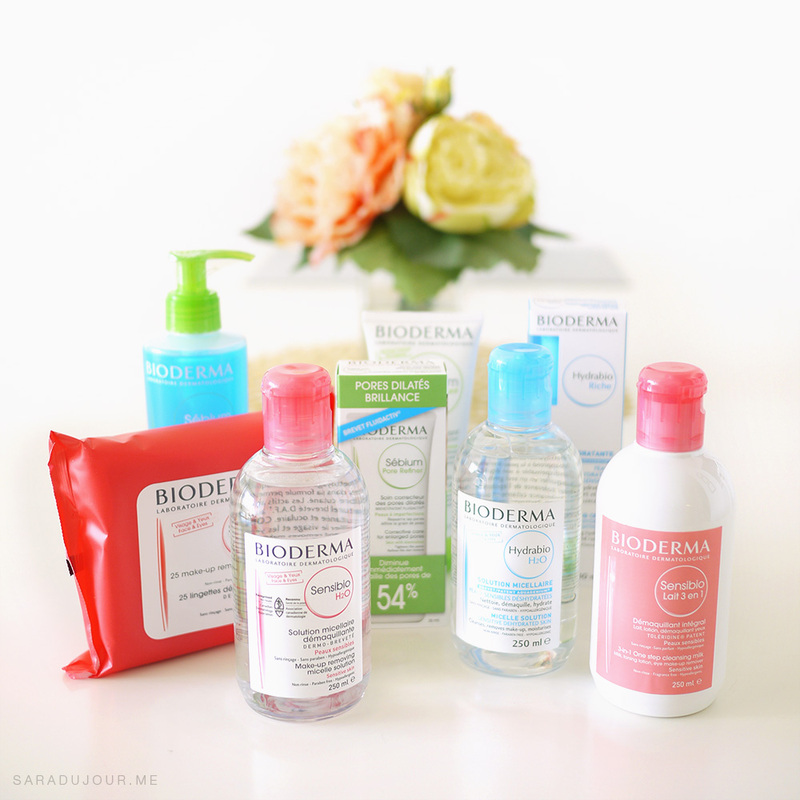 I had heard so many great things about Bioderma skin care products, so was eager to find out how they’d work for me and my skin. When the big package arrived in the mail, I thought Christmas had come early! 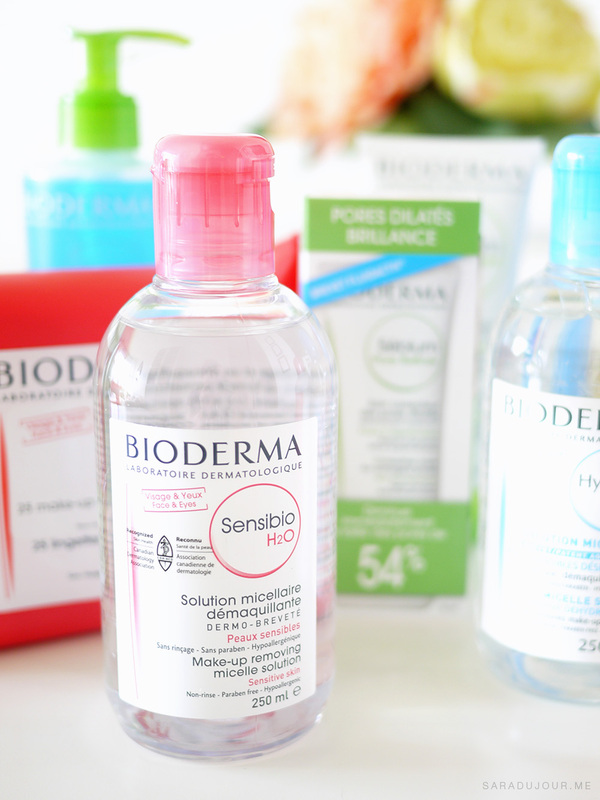 Bioderma has multiple lines for different skin types, each with their own name and colour. Since my skin can at times be dry, and at times combination, while always being sensitive and prone to blemishes, I was sent a few products from 3 of the different ranges to meet my skin’s needs. Before I go into a more in-depth review of the products I tried and loved, here’s a list of all the products I’ll be mentioning. 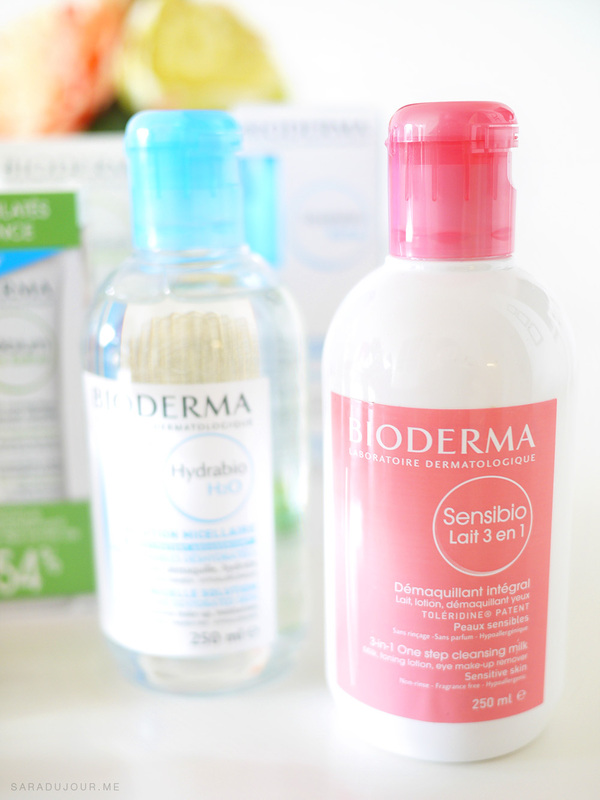 I took about a month with these products before I wrote this Bioderma review, because I wanted to make sure I had enough to properly test them out before telling you guys what I thought. Certainly the product I was most excited to try out was the Sensibio H2o make-up removing solution, since that has been a consistent holy-grail product for beauty gurus everywhere. I used it by soaking a cotton pad and applying it all over my face. I found it felt comfortable on my skin, and was happy that it was fragrance-free, since I have sensitive skin. It did a great job removing all of my face makeup, but I found it wasn’t able to remove my eye makeup as well, since I use waterproof liquid eyeliner and mascara daily. If you don’t though, this stuff will take off all your makeup, no problem. I appreciated that it was a non-rinse formula, which is great for when you’re in a rush, though I tend to rinse my face afterwards anyway. 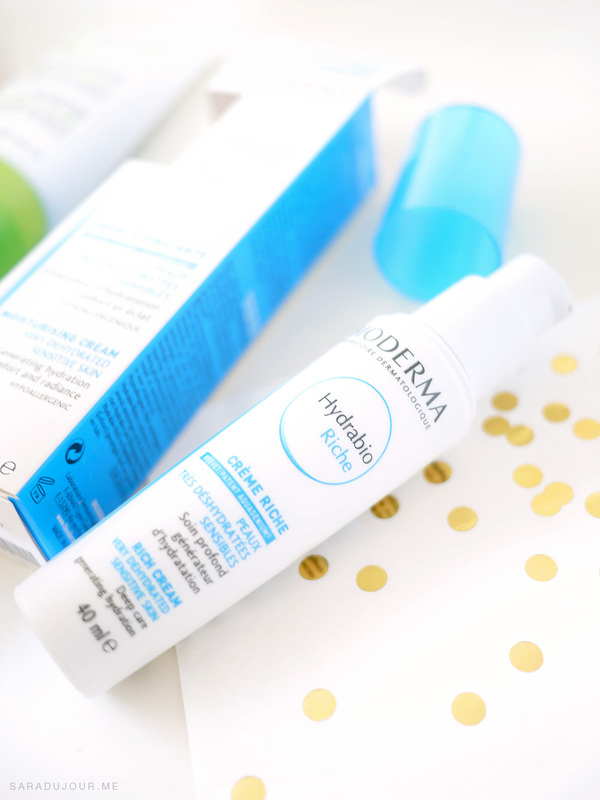 My experience with the Hydrabio H2O was the same – it felt great on my skin, and though this one was a slightly different formula (for dehydrated, sensitive skin) I wasn’t able to notice a discernible difference from the Sensibio formula. It too struggled a bit with my waterproof eye makeup, making my mascara crumble off bit by bit rather than being able to actually break it down and dissolve it. 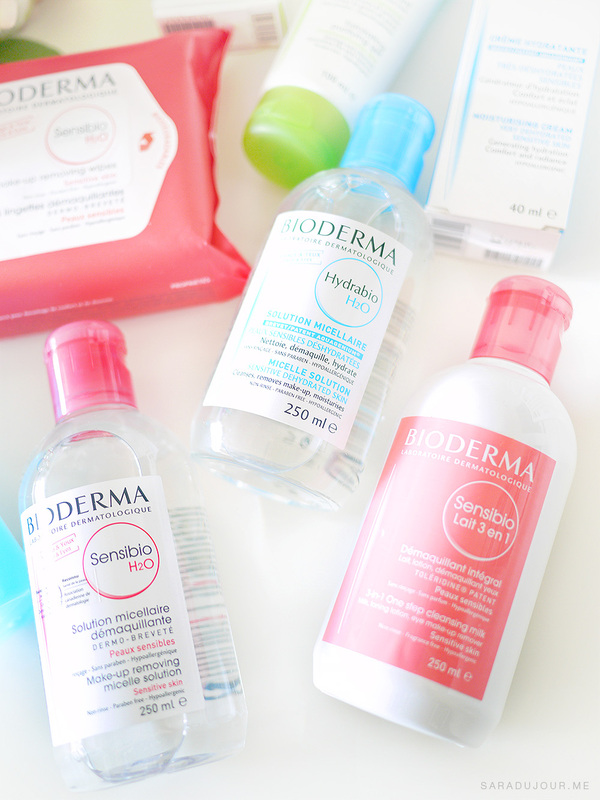 Of the three, the 3-in-1 cleansing milk was actually my favourite! I used it on my Clarisonic Mia and it washed off all my face makeup with a wonderful, creamy texture. Applied on a cotton pad on my eyes, it did a much better job of dissolving my eye makeup. This formula is also non-rinse, fragrance-free, and hypoallergenic. The “3-in-1” element is because it’s a cleansing milk, toning lotion, and eye-makeup remover, all in one. 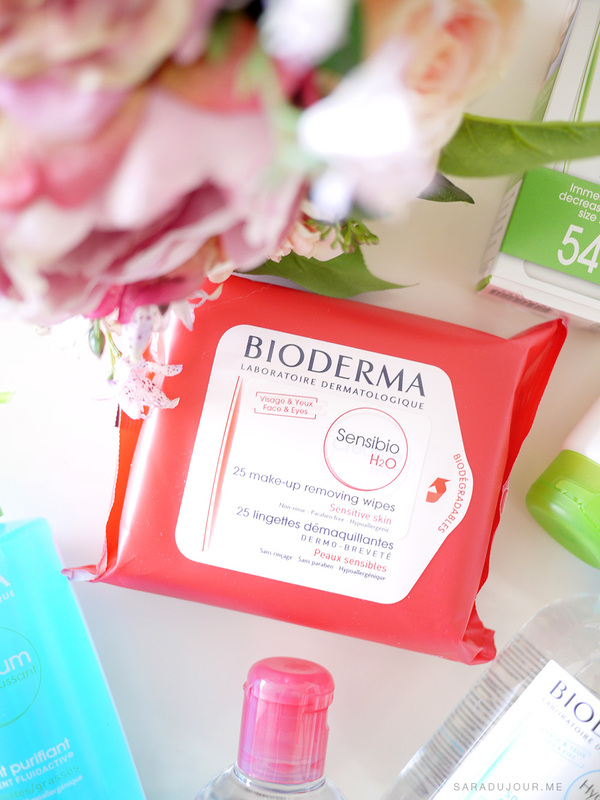 Make-up removing wipes are a great product to have on hand. Though I generally prefer cleansers in liquid form, wipes are super handy on nights when you’re feeling too lazy to get up and actually wash your face. We all know that sleeping with makeup is a big no-no for your skin, so keeping these by your bedside are fantastic to give yourself a quick wipe-down before slipping into a deep slumber. I found these Sensibio H2O wipes gentle on my skin, and less slippery feeling than many other makeup wipes I’ve tried in the past, which I liked. Because of this, I find them a bit rougher – but I mean this in a good way! I feel like they really work to remove the makeup from my skin while gently exfoliating, whereas a more slippery wipe can kind of just slide your makeup around. A tip for makeup wipes – store them upside down, so each new wipe you take out is the most soaked with product. My skin varies a little bit in type based on a few factors, like the season and how much sleep I’m getting. If I’m severely under-slept, I notice that my skin gets oilier throughout the day, especially on my T-zone. 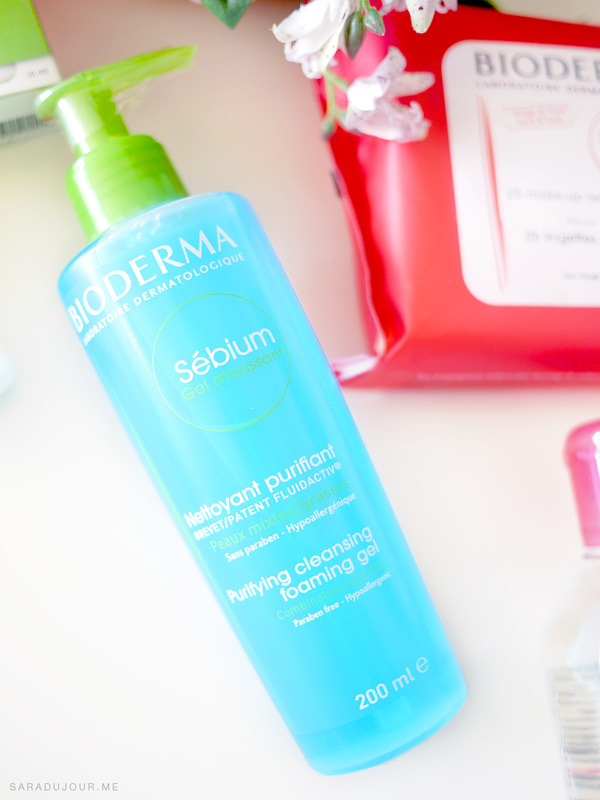 On those days, I used this Bioderma purifying cleansing foaming gel for combination/oily skin in an attempt to re-balance my skin before bed, followed by my favourite nightly moisturizer – avocado oil. As the weather gets colder and my skin gets drier, I’ll be glad to have this Bioderma Hydrabio Rich Cream deep care moisturizer to keep me moisturized and glowing all throughout the winter. You’d never guess it from the name (ha), but this cream really is rich, so a little goes a long way! I don’t typically wear primer, because 1) it sometimes breaks me out, and b) I don’t find it to be a necessary step in my routine. 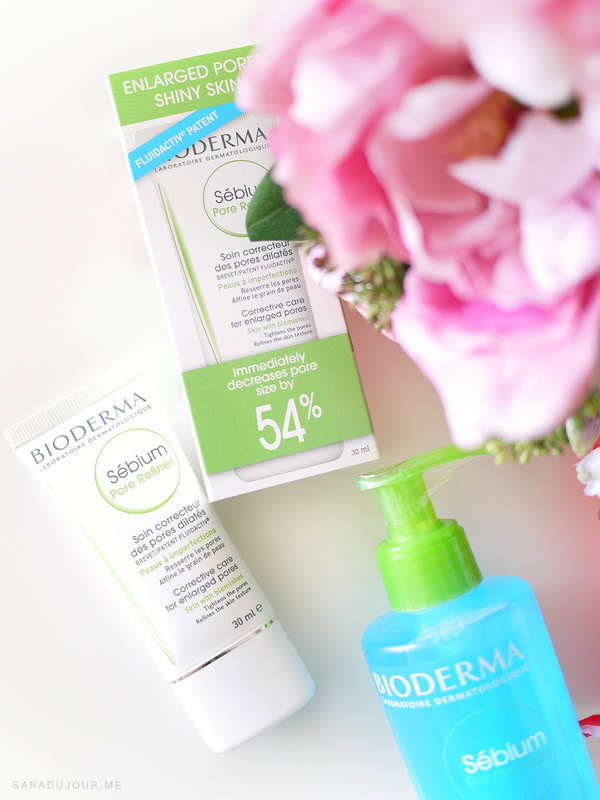 This Bioderma Sébium pore refiner sits somewhere between being a moisturizer and a primer, to me. I tested it by using it both on top of my morning moisturizer and instead of it, and it seemed to work both ways. While I didn’t notice any drastic difference in my skin with this, it did mattify a bit and helped my foundation apply smoothly. It dries down really quickly, which is great for the morning scramble, and it doesn’t have that super slippery feeling that so many silicone-based primers do. I don’t use exfoliating products extremely often, since I use my Clarisonic Mia daily, and that helps to slough off any dead skin cells, while cleaning out my pores. It’s also important not to over-exfoliate your skin. 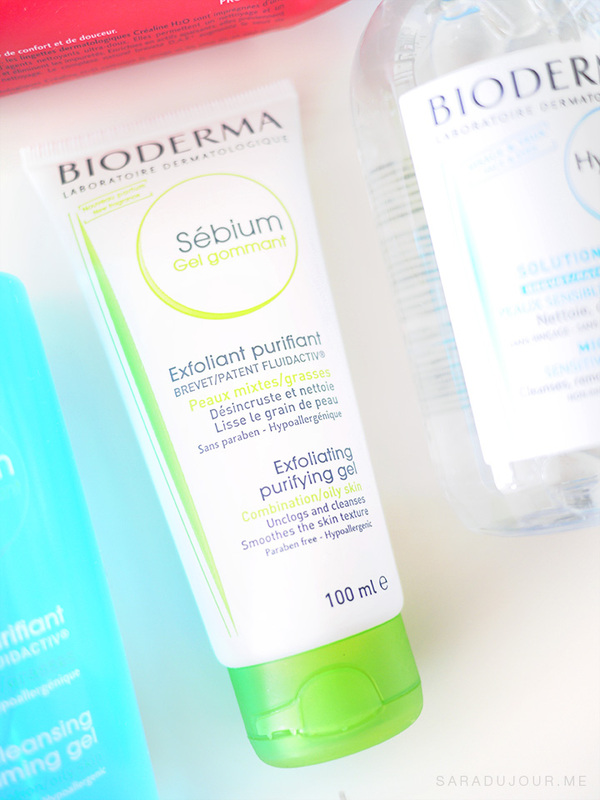 However I did try this Bioderma Sébium exfoliating purifying gel a handful of times and it did leave my skin feeling really nice and clean afterwards. So to sum it all up – I’m a fan! I would definitely keep using the makeup wipes and the cleansing milk in particular, as well as the Sensibio H2O make-removing solution. Those are my picks of the bunch! The cleansing milk sounds fantastic! Love the photos.